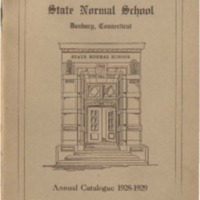 “State Normal School, Danbury, Connecticut, Annual Catalogue 1928-1929.” WestConn publications and yearbooks, RG8.1. WCSU Archives, 15 Oct. 2018. Accessed on the Web: 19 Apr. 2019.